The kakejiku is produced through several urauchi backings. 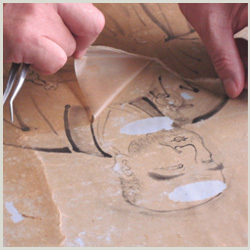 “Urauchi” is the act of applying paper to the back of paper, silk, or fabric with paste for reinforcement. 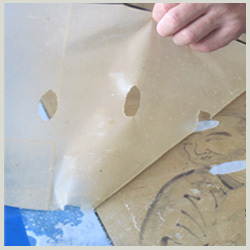 The first step in remounting kakejiku is to remove the old backing papers carefully. Generally, there are three backing papers. They are applied in the order of “hada ura-uchi”(the first), “mashi urauchi”(the second), “sou urauchi”(the final) from the back of a “honshi” main artwork. When removing the papers, we start working on with outside, “sou urauchi”(the final) in reverse order. 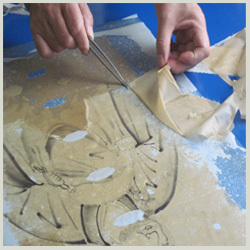 The degree of difficulty varies depending on the condition of the work and the adhesive force of paste used in the former mounting. When it comes to degree of difficulty, the closer to a main work, the harder it will be. 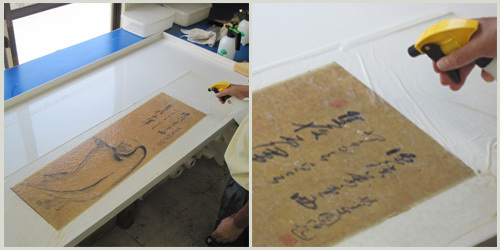 Therefore, removing “hada ura-uchi”(the first backing) is most difficult since it is directly applied to a main artwork. It is also regarded as the most difficult step in the whole repair procedure. 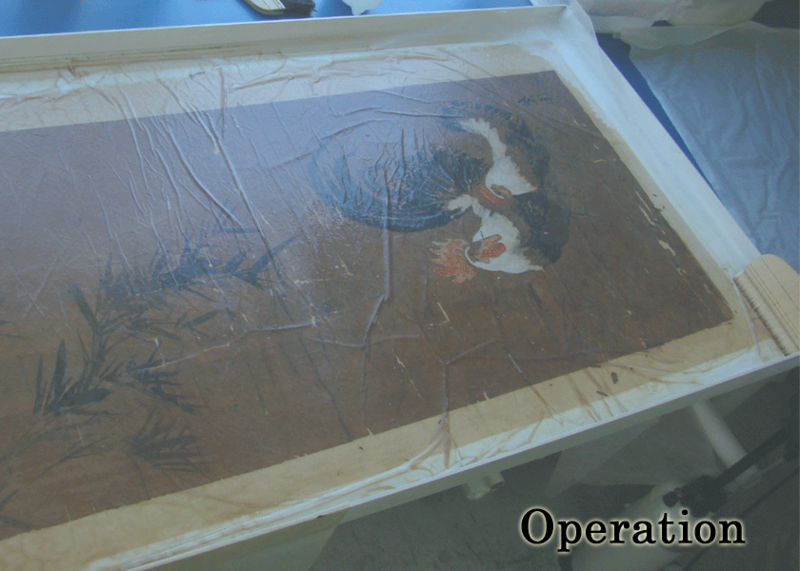 If this operation is not done properly by a skilled craftsman “hyougushi,” the work might be damaged. 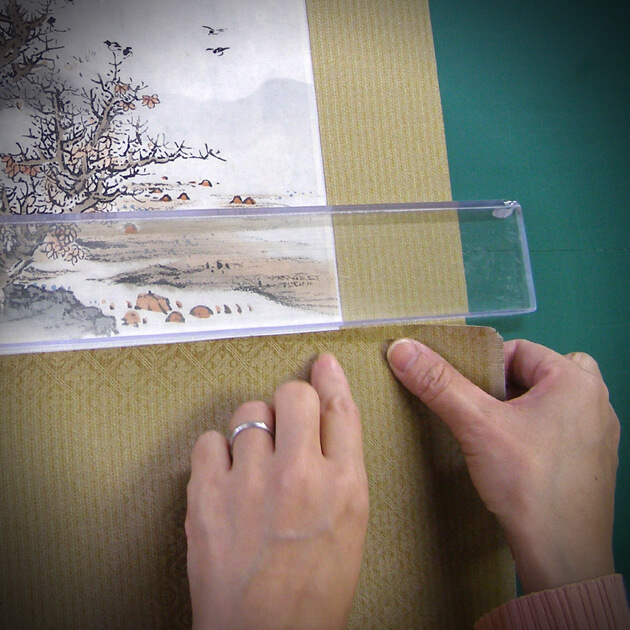 A “hyougushi” scroll mounter focuses all of his attention on his fingertips and strips the first backing paper carefully not to damage a main artwork. An artwork reveals its true self as each backing paper is stripped away. We removes dirt with our own, unique method. We must not spoil the antique beauty of the work that has caused its aesthetic value to grow over the years. It doesn’t always mean best to clean the work thoroughly. This is a very difficult decision. We remove dirt with cleaning solution. We clean off the dirt. We remove the dirt gently with a brush. 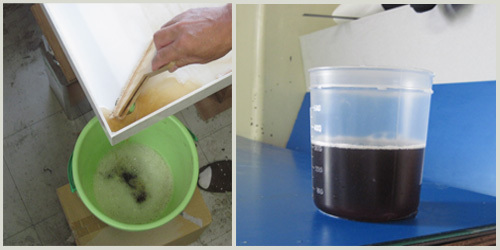 We remove the cleaning solution with a neutralizer. We can see the dirt removed from the work by cleaning. The water is colored by the dirt, not the cleaning solution. This shows how dirty the work was. 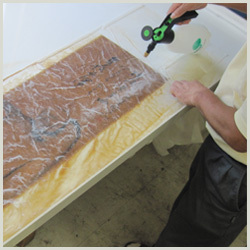 Stains may occur in a work due to moisture, a chemical change and so on. We must use chemicals properly, depending on the condition of a work. A severely damaged work isn’t always able to stand up to chemicals, so the craftsman’s judgement is very important. We must choose the appropriate method in consideration of various situations. The overuse of chemicals may damage a work, so we use them in small amounts. 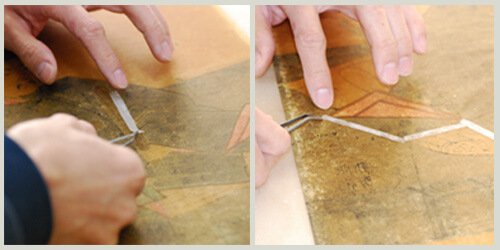 Creases result from repeated rolling and unrolling of a kakejiku (hanging scroll). They are the cause of friction in fabric or the main work as well as exfoliation of the pigments. We apply infill paper to creases or cracks on the backside of the main work after initial or subsidiary backing. Narrow strips of strong but thin pieces of Japanese paper are used. 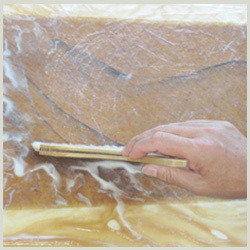 This crease reinforcement strip is called “ore-fuse” or “ore-ate.” Ore-fuse is applied from the back of the backing paper. 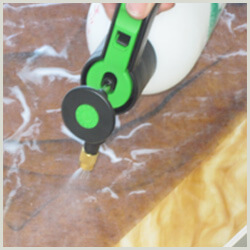 We can reinforce creases and prevent them from occuring again. This operation is very delicate and time-consuming. 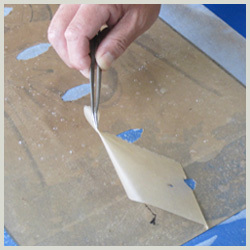 We apply ore-fuse (the long thin Japanese paper) to creases or cracks on the main work for the purpose of reinforcement. 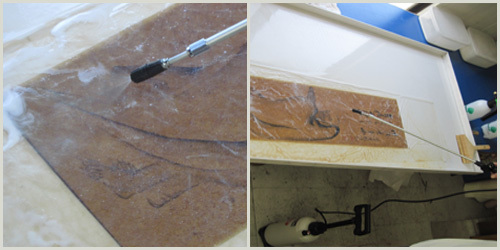 If a work has severe damage, it is very hard to reinforce countless creases. 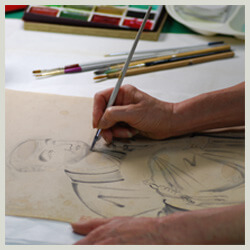 If the condition of a work is bad, a part of the artwork may be lost. 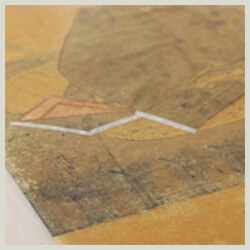 Even with a backing, the work may still appear unnatural because of extensive deterioration. After obtaining the permission of a client, we sometimes add lines or color in order to fill in lost parts on the work. This operation is very delicate because it requires an understanding about the work, a sensitivity to colors and a specialized knowledge about painting materials.